It’s that time of year again, PPLA fans! With the SAG nominations underway as of yesterday and the Golden Globe nomination’s arrival today, it is safe to say that awards season has finally begun. Angela Bassett, Dennis Quaid, America Ferrara, and Chloe Grace Moretz announced the nominees early this morning. In light of the nomination announcement today, it is time to discuss our reaction to this year’s nominees. We must admit, we are quite pleased with the Hollywood Foreign Press Association’s picks this year. Where do we even begin? In television, we have a few newcomers’ to the scene, including Lady Gaga for her role in American Horror Story: Hotel and Rachel Bloom for her role in The CW’s Crazy Ex-Girlfriend. However, if you’ve seen Crazy Ex-Girlfriend, there is no way you can be surprised at this nomination! And if you haven’t seen Bloom in action, it’s never too late to start now. In addition to this, we have several returners who’ve nabbed nominations this season. After a surprising win last year, Gina Rodriguez received her second Golden Globe nomination for The CW’s Jane the Virgin. Although she had won the year prior, we’re not sure this will be her year—that’s okay though. There’s no harm in sharing the love! Considering Eva Green had a lot of buzz circulating her arrival to television on Showtime’s Penny Dreadful and didn’t nab a nomination last year, we are a little surprised to see her land a nomination this year. 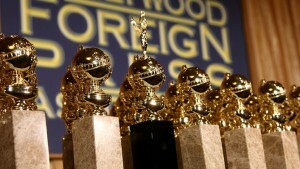 We are assuming that the HFPA had come to their senses! Some television nominations that we expected to see included Julia Louis Dreyfus (Veep), John Hamm (Mad Men), and Viola Davis (How to Get Away With Murder). However, there are some actors and television shows that we are shocked to see missing from this year’s selections. Yes, it is true to say that Hamm received his well-deserved nomination for Mad Men. However, the show was neglected a nomination for Best Drama? They were robbed of a proper farewell. I guess the HFPA felt that awarding Hamm a nomination was a satisfactory farewell in itself. In addition to this snub, we are extremely disappointed that the HFPA “forgot” to award Amy Poehler a nomination for Parks and Recreation—and neglected the show as a whole. Parks and Recreation has pretty much received a huge slap in the face because they can’t seem to win—or, be noticed in general. Now that we’ve hashed out our opinions regarding the television nominations, it’s time to move over to film. Although Jennifer Lawrence didn’t receive a SAG nomination for Joy, the Golden Globe’s didn’t forget about Hollywood’s favorite “it-girl.” Not to mention, her buddy Amy Schumer was nominated too within the same category—Best Actress in a Comedy or Musical. We don’t know who will take the win on this one, but we would do anything to snag a seat between those two at the ceremony! A lot of buzz centers around Alicia Vikander as she’s nominated for Best Supporting Actress in a Drama for Ex Machina and Best Actress in a Drama for The Danish Girl. However, she is one of three other nominees to have nabbed two nominations this season, including Idris Elba. Hollywood’s newest favorite, Brie Larson, received her first-ever Golden Globe nomination for her role in Room. This year’s Best Actress in a Drama race will be tight. However, we’re thinking the battle could be a tie between Larson, Saoirse Ronan, and previous winner Cate Blanchett. As for the Best Actors category, we are definitely not surprised to see Leonardo DiCaprio’s nomination for his role in The Revenant. However, could this finally be his year to win? He definitely has a shot! Yet, Eddie Redmayne could potentially win for a second year in a row for The Danish Girl. Although we are a little upset to not see Michael B. Jordan nominated for Creed, we weren’t too shocked by this snub. Regardless, he will have his chance someday soon! As for other film nominees, we are a little surprised to see Mark Ruffalo making the cut for Best Actor in a Drama. Now, we can respect Ruffalo’s acting abilities. However, his movie Infinitely Polar Bear barely surfaced on the radar after it’s Sundance release. So, why did he receive this nomination? We aren’t entirely sure. As another surprise, we are very surprised to see that Spotlight was completely snubbed by the HFPA. Michael Keaton was assumed to be a shoe in this season for his role in the acclaimed drama. However, no such luck. The only actor to receive recognition from Spotlight is Rachel McAdams—only at the SAG’s though. Fortunately, the SAG didn’t forget about the cast! Lastly, where are Tom Hanks (Bridge of Spies) and Johnny Depp’s (Black Mass) nominations? We are at a loss words for these two. Which nominees did you expect to make the cut? Which nominations surprised you the most? Who do you think deserved a nomination this year? Let us know your opinions below! Make sure that you catch Ricky Gervais hosting this year’s Golden Globes ceremony on Sunday January 10, 2016!